Did you know that Swiss chard is a member of the beet family? I'm growing it, and I didn't know that! My husband learned this from a crossword puzzle this week and shared with me. 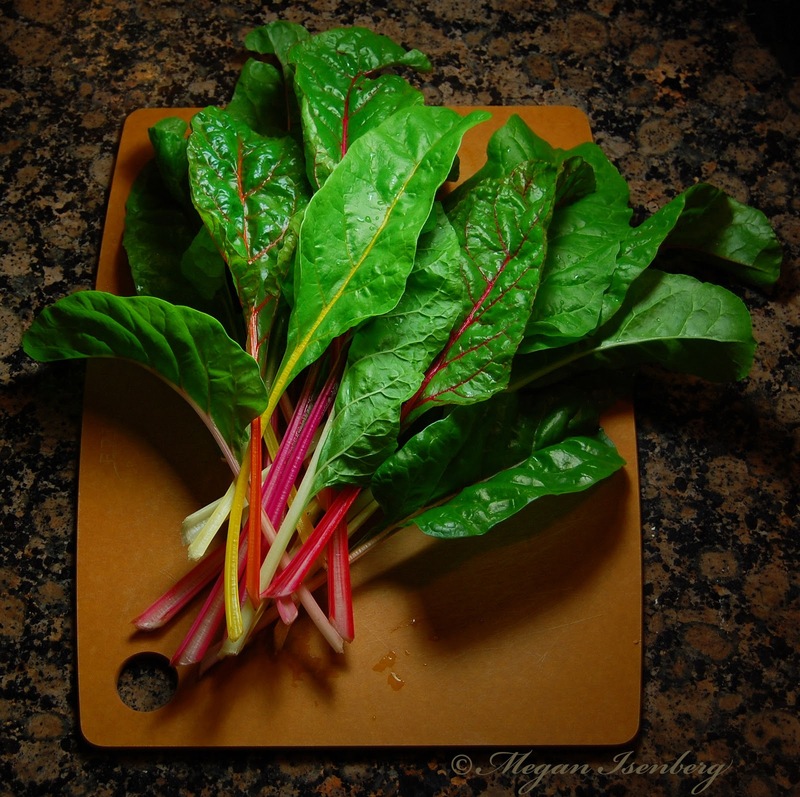 Another thing I didn't know about Swiss chard when I started growing it... how to cook it. I've been procrastinating harvesting the chard because I wasn't sure what to cook with it. But it was getting pretty out of control, so I finally decided to take some in last night. I found a recipe with great reviews on Allrecipes.com that called for baking it with feta cheese. It was an easy recipe, but I have to admit, the result was not my favorite. I don't know if it was the recipe or the chard, but it came out very bitter. I had heard that chard is milder than spinach, but this was definitely not! I want so badly to like Swiss chard because it's such a pretty, hardy garden plant. I will definitely give it another try with a different recipe. Meredith's suggestion from last week looks good! Any additional suggestions? My next problem was finding seedlings. In the midst of finding and buying a house, I hadn’t started any seeds for a fall garden, and it was a bit too late to start broccoli, cauliflower, or cabbage indoors. I was headed home from a local gardening store when I happened to pass Hartke Nursery. My parents had bought me and my husband a tree from Hartke for our anniversary (a Japanese Maple, now planted in our yard! ), so I had been there once before. I decided to pull in and take a look around. I wandered through the rows of plants for sale and happened on a table with fall vegetable seedlings. They didn’t have many, but they had almost everything I wanted! I bought a six-pack each of broccoli, cabbage, cauliflower, mixed lettuce, and Swiss chard. (I would have liked to plant sugar snap peas and spinach, but I’ll get to those next year!) I got home, popped them in the garden, watered them in, and they have been growing happily ever since. I fortified the garden against the numerous squirrels and rabbits in our yard with plastic chicken fencing stretched around four metal fence posts, and they haven’t broken in yet. 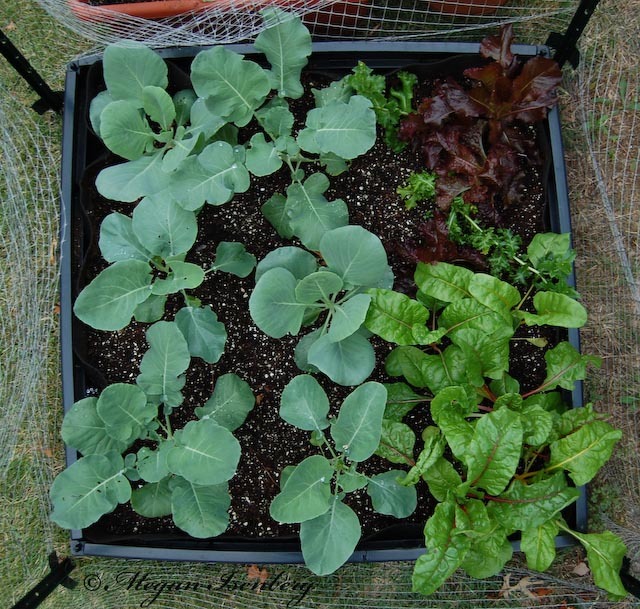 The founder of this method would tell you that my garden isn’t a “true” square-foot garden because I don’t have dividers marking off each square. Maybe next year. I was more focused on getting the plants in the ground! I should have the first harvest of Swiss chard this weekend. (I must confess that I’ve never actually eaten Swiss chard before, but it’s so pretty and hardy that I just had to grow it.) I hear you prepare and eat it like spinach. I’ll let you know how it is. The lettuce has been the least happy of the plants; although still growing heartily, some of the plants started to bolt as the temperature climbed back into the 100’s a couple of weeks ago. I'm so glad we finally seem to be done with the heat! I’ll post updates on the garden’s progress. So far, I’m loving this square-foot gardening method! Is anyone else growing fall vegetables and/or using the SFG method? What do you think? Does anyone have a good Swiss chard recipe to share? Back in the spring, I started a handful of seedlings in a corner of our little apartment. Under a single grow light, they sprouted up until I had more seedlings than I could possibly pot on my tiny 2- by 4-foot patio. So, I planted a number of herbs, two tomato plants (one a yellow pear tomato and the other a red slicing tomato), two pepper plants (one bell, one hot), and about a dozen carrots, and gave the rest of my seedlings away to good homes. My plants adapted to their new outdoor habitat, growing thicker and stronger in the breeze and taller with the moderate sun reaching my patio. However, as the summer arrived and blasted us with scorching heat and weeks without rain, it was hard to keep the plants happy. One of the pepper plants, the rosemary, and the chives withered and died. Something infested my tomato plants, which got silvery scales on their leaves (let me know if you know what this is… I’m still not sure!). The hope and enthusiasm I felt while nursing the seedlings along in early spring wilted as well, but I kept the remaining plants limping along. In midsummer, my husband and I bought a house (hurray!). We packed everything up, and I decided to leave the sickly tomato plants behind. The remaining pepper plant, basil, and carrots traveled with us to our new home. As the summer wore on, the carrots became quite stunted and the tops dried out. The basil plant suffered in 100-plus-degree heat without water for several days while I was out of town. 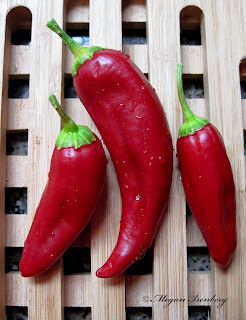 However, the pepper (which turned out to be the hot pepper) plant has survived and produced several good peppers! A little ray of hope for my gardening skills! It is so amazing to look at these vegetables and remember the tiny seed I planted so many months ago. 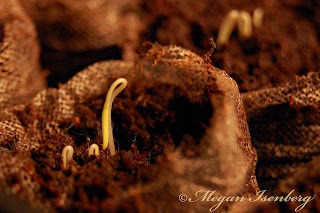 The seedlings that I sent out into the world have fared a little better than my own. My sister’s pear tomato plant is producing little yellow tomatoes, as are the plants of some friends. I hope to make another attempt with these next year. Now that we have our own bit of land, I'm excited to try my hand at gardening again! Uhh, we don't really do that. I met a former professor and friend for lunch a few weeks back, and, by virtue of what’s near my work, we wound up eating at one of those home-style chain restaurants. (I would tell you which one, but I honestly can’t remember… those places all seem the same to me!) There was nothing meatless on the lunch menu, so I ordered a cranberry chicken salad without the chicken. Imagine my surprise when it arrived with bacon! (I guess I hadn’t read the description carefully enough… but, honestly, who puts bacon on a salad with fruit, nuts, and chicken?) I wish the waitress had warned me! I am sure there are some restaurants around here that are more vegetarian-friendly… someone please help me find them! Enough about eating out. 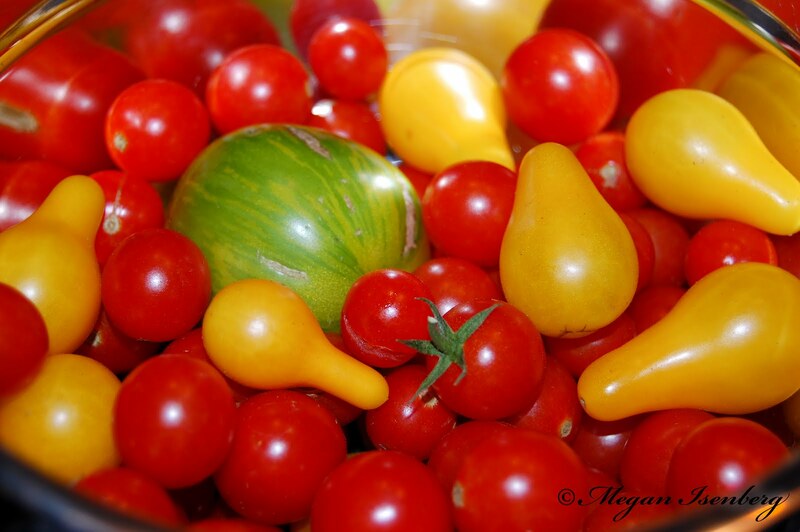 Nothing compares to fresh-picked vegetables! My mother-in-law has a fantastic green thumb, and we have been the beneficiaries of her garden since arriving back in town. These delicious tomatoes came from her backyard. Hello, friends! Well, it has been quite a while since I’ve updated Ethivore. I don’t have much to say by way of excusing myself, except that sometimes life gets in the way of our best intentions. When I started this blog, I was just out of grad school, trying to find work in a bad economy and looking for something to keep me sane while enduring that disheartening process. Just after my last post I started a full-time temporary job, and in the spring I was lucky enough to begin a permanent position in publishing. 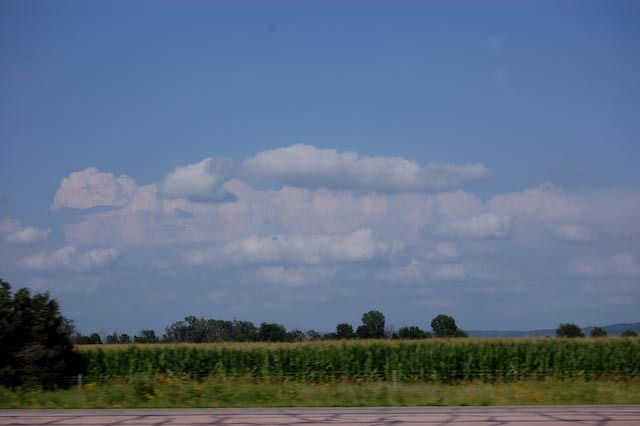 This brought my husband and me back to the Midwest, closer to family and friends, which we are enjoying very much. Now that we’re settled in, I think it’s time to get back to Ethivore! I have yet to explore the local landscape of ethical food or connect with people in St. Louis who are working toward a sustainable food future. I hope to investigate these topics, as well as more global food issues and news items, as I return to this blog. 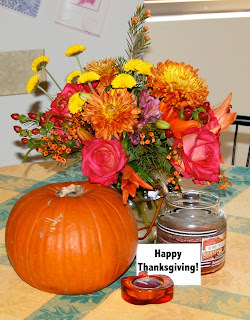 And, of course, I will continue to bring you some of my favorite seasonal recipes! Feel free to leave me suggestions about local events or places that I should check out. It’s good to be back! Ethivore is taking a break for the rest of the week to enjoy time (and good food!) with family and friends. 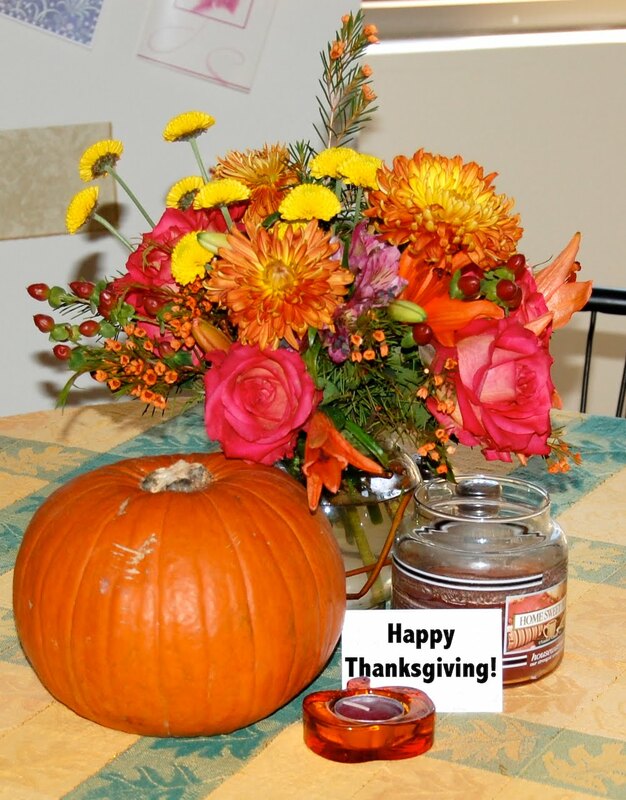 I hope you all have a wonderful Thanksgiving! Look for updates on the blog next Monday. And don't forget to leave your feedback to help me make Ethivore even better! I am getting excited for Thanksgiving on Thursday! Looking forward to seeing family and friends, and enjoying my dad's wonderful cooking. Dad agreed to share his recipe for one of the dishes I look forward to every year- his fantastic holiday stuffing. Now you too can make it part of your Thanksgiving spread! Melt the butter in a large pan and sauté the scallions until they are limp but not crispy or brown. Add the celery and spices and sauté briefly. Pour the mixture over the bread crumbs, stirring to coat evenly. (If you use dry crumbs, add water first to rehydrate them before pouring the butter and seasonings on.) Stir in the pine nuts. Put some of the stuffing in the turkey just before baking and bake the rest for an hour or so in a separate covered pan. Pass around the table and enjoy! One who takes into consideration a range of ethical issues when procuring, preparing, or eating food. Considerations may include sustainability, the impact on natural and human environments, animal welfare, workers’ rights, dynamics of power, food safety, and/or personal and public health. The content on this blog is the intellectual property of Megan Isenberg, unless otherwise stated. Please do not reproduce the text or photographs without express permission of Megan Isenberg. E-mail ethivore@gmail.com.